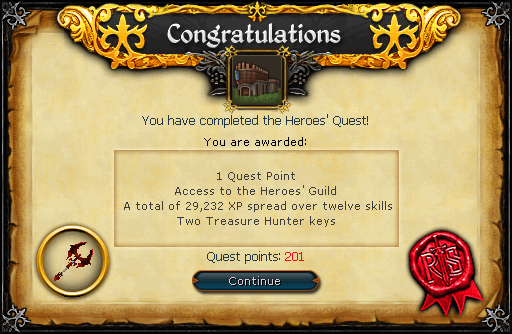 The Heroes' Quest was once the hardest in Runescape, however no it has been relegated to a chore list for mid-level players. However, don't underestimate the challenges faced! Begin by speaking to Achietties in front of the Heroes' Guild. You can start this quest by speaking to Achiettes outside of the Heroes' Guild. in southern Burthorpe. She will talk a bit about how great the Heroes' Guild in a completely unbiased fashion. Ask if you can apply and if you have all of the quest requirements you can begin. She will tell you about the three items required for admission into the Heroes' Guild: An Entranan Firebird feather, a Master Thieves' armband, and a cooked Lava Eel. To get the Entranan Firebird feather, you must kill the Entranan Firebird. It is level 2 and attacks with range. Being a hero is pretty easy, right? Maybe not. The feather is very hot and oven mitts have yet to be invented, so to pick up the feather you must be wearing ice gloves of the Ice Queen. 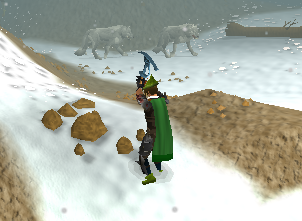 Go to the end of White Wolf Mountain just to the north of the gnome glider. To get here, you can either walk or take the gnome glider if you have completed the Grand Tree. There are rocks obstructing your path to the ladders, so right click them and mine them (a pickaxe in the toolbelt works here). Go down the southernmost ladder and you will find yourself in the Ice Cavern. The Ice Cavern is difficult to navigate and filled with level 74 Ice Giants, level 78 Ice Warriors, and level 60 Ice Spiders. 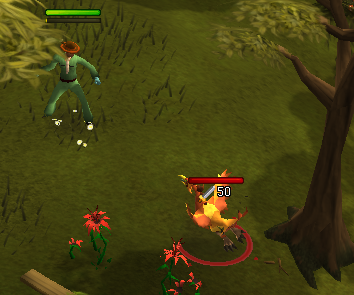 These monsters may or may not be aggressive depending on your combat level. At first, you should be at the green ladder. Run west to the blue ladder and climb up it. Climb down the easternmost ladder and you should be at the yellow ladder. Follow the passage north, east, and south until you reach the red ladder. Climb up that ladder and then climb down the ladder northeast of that one. You should be at the purple ladder and inside a room with ice warriors and the Ice Queen. Now all you have to do to reach the Ice Queen is run north. What a shame, you were just starting to have fun with the ladders! The Ice Queen is level 110, has 5500 hitpoints and attacks with melee. She has no listed weaknesses. The Ice Queen also cannot be attacked from afar over the Ice Throne or any other objects. She is in a room full of ice warriors, so if those are attacking you fight the Ice Queen behind the throne. Kill the Ice Queen, pick up the ice gloves and leave the cavern. 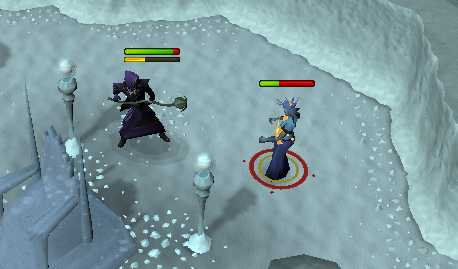 Bank all armor and head to Entrana, which can be travelled to by speaking to the monks in Port Sarim. 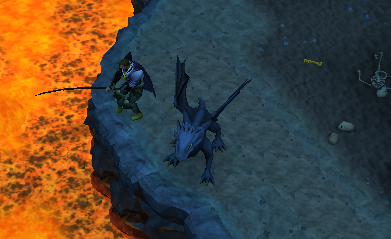 The Entrana firebird is on the northern half of the island west of the law rune altar. It only has 50 hitpoints, so it should not be difficult to kill for any prospective heroes. With ice gloves equipped, pick up the fire feather. If you plan on doing either Desert Treasure or the final battle of Recipe for Disaster in the future, hold onto the ice gloves. You can start by using the Port Sarim Lodestone teleport spell and heading a few steps north to the fish shop. Speak to Gerrant and tell him you want to catch a Lava Eel. He will tell you no ordinary line can catch anything in lava and that you're going to have to make some altercations to your rod before attempting to fish. He will give you some Blamish snail slime. Now buy a fishing rod from Gerrant (if you don't have one in your inventory already). Get the Harralander and put it into your vial of water, creating an unfinished Harralander potion. Now use the Blamish snail slime on the unfinished potion to get Blamish oil. Apply the Blamish oil to the rod and you've got yourself an oily fishing rod. Now it's time to fish the Eel. Lava Eel can be fished in the lava rivers in Taverly Dungeon and the Lava Maze. 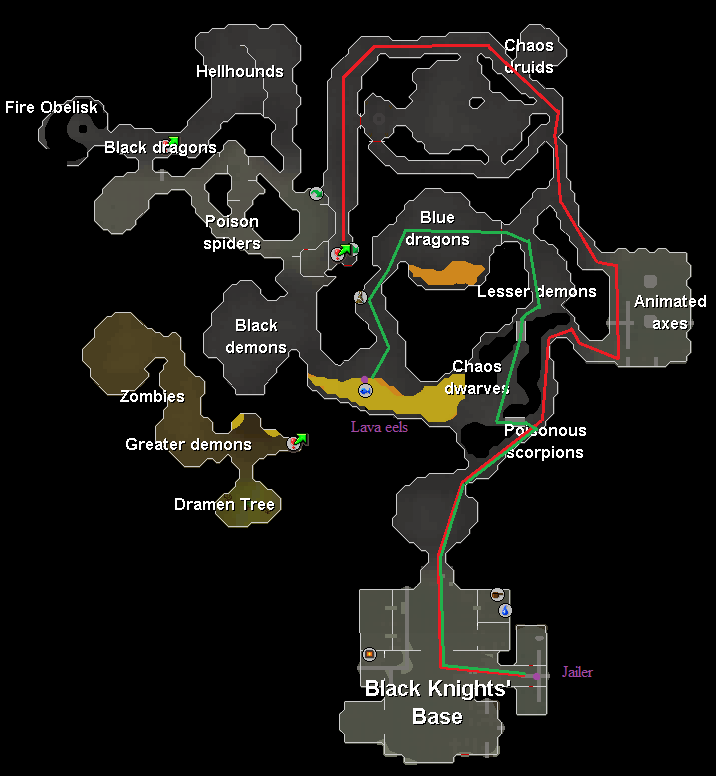 Since the Lava Maze is deep in the wilderness and not a popular option the guidewriters aren't going to get into that here, but if you are feeling like Evil Knievel today and wish to fish for lava eels in that area check out the Lava Maze guide. To prepare for your volcanic fishing trip, take out some armor, a weapon, decent food, an anti-dragonfire shield, and of course your oil fishing rod. Cast Taverly Lodestone teleport, head west across the bridge and then south. Next to the wheat field should be some steps. Go down these stairs and you will be in Taverley Dungeon. If you have level 70 agility, you can use the agility shortcut and run south to the Lava Eel fishing spots. If not, follow along the red route in the map above, past the Skeletons, Ghosts, Black Knights, and through the Animated Axe room. After that, you'll see some lava, along with some Poison Scorpions. Run south past them until you find yourself in a large room with Black Knights. In the Easternmost portion of the room is Velrak the Explorer, who has a key that will let you access the lava eel fishing spot. Unfortunately for you (and Velrak! ), he is locked up in a cell. Kill the level 56 Jailer who should drop a jail key. Now use the key on the cell door. Talk to Velrak and ask if there are any places to explore. He will give you a dusty key. Now head back via the green route. Run past the level 100 lesser demons and eventually you should run into a gate. 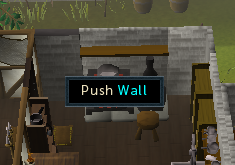 Use the dusty key on the gate and you should be in a room with blue dragons. Run to the west and then south and you should come across a fishing spot in lava. This is where you are going to catch the lava eel. The fishing spots are hard to see, so if you can't find any run your cursor over the lava and find the fishing spots that way. Once you have your lava eel you should teleport out. Although they live in temperatures ranging from 1000 to 2000 degrees, lava eels ironically do not come cooked. So all you need to do now is cook it and your done with this part of the quest. Lava Eels cannot be burned, so don't worry about having to get another lava eel. For this part, you're going to need a partner from the opposite gang that you picked during The Shield of Arrav. Pheonix gang members will need a Blackarm gang members, vice versa for Blackarm members. 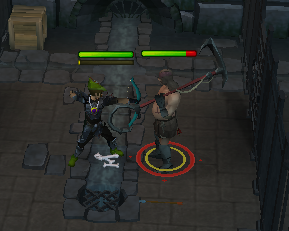 Talk to to your the Black Arm Gang's leader Katrine in Varrock. She is in the southwestern corner of the city. Ask how you can become a master thief. She will tell you that you could steal a candlestick from Scar Face Pete of Brimhaven. You will need some black armor in this upcoming section, so before going to Brimhaven purchase a black full helmet, a black platebody, and black platelegs. Head to a building that borders the free-members boundaries northeast of the pub. When you try to open the door, give the password "four leaved clover." Once inside, talk to Trobert. He will tell you to impersonate an ex-black knight and will give you fake ID papers. If you are under drinking age and not interested in finishing the quest, bring your fake ID to the pub! Otherwise, you should go to the westernmost building in Brimhaven. Equip your black armor to enter and talk to Grip. Ask if what your duties are and then if there's anything you can do now. He will give you a key. Give this key to your Phoenix Gang partner. Once your partner is in the room to the east, look through Grip's liquor cupboard. This will send Grip into the room, allowing your partner to kill him. After Grim is dead, pick up the key and gain access to the treasure room to the west. One of the chests contains two candlesticks. Give one to your partner. Return to Katrine, who will give you the armband. Speak to your gangleader, Straven, at the Pheonix hideout in Varrock. Ask about the Master Thieves' Armband and he will tell you that he will want some candlesticks from Scarface Pete, the pirate leader on Karamja. He will tell you about the contact, Alfonse, and the secret password "David Hasselhoff" "Gherkin." Now with a bow and arrows head over to Brimhaven by either using the lodestone teleport or by boat and speak to Alfonse the Waiter in the food store. Ask him if he sells Gherkins and he will tell you to talk to Charlie the chef. Head through the door to the north and speak to Charlie the Chef. Again, tell him you're looking for a Gherkin. He will speak of a wall in that room which leads to Scarface Pete's mansion. It is the wall south of the range. For this next part you're going to need the miscellaneous key from your partner. Push the wall and run past the dogs and open the door to get into Pete's mansion. Make sure you close the door behind you so all of those raucous dogs stop attacking you. Using the miscellaneous key, open the door to the north room. When your partner leads Grip to the adjacent room, attack Grip. Your character should be able to fire arrows through the hole. Once you have killed Grip, your partner should pick up Grip's key and loot the candlesticks from the chest. Head back outside and your partner will give you the candlestick. Return to the Pheonix hideout and speak to Straven, who will reluctantly give you the armband. Head back to Achietties with the firebird feather, cooked lava eel, and master thieves' armband. When you talk to her she will lead you to think there is another task you must do, but she's just fooling around. She will give you your real reward. Congratulations, Quest Complete!